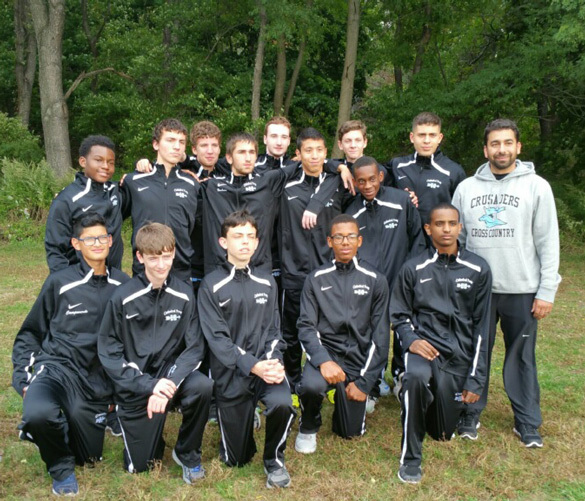 Among the members of the Cathedral Prep cross-country track team are: back row, from left, Rasheed Kelly, David Gaskey, Fernando Ronocni, Stephen Barbaro, Brendan O’Leary, Paulo Salazar, Michael Bode, Kyle Frederick, Alexander Fitissov, Coach Larry Medina; front row, from left, Dyango Campoverde, Antoine Haran, Daniel Maher, Emmanuel Ambroise, and Daniel Berhan. Building an athletic program at a high school often takes on the feel of a farmer sowing seeds in a field. With the proper attention and care – while also allowing those seeds enough time to reach their full potential independently – a bountiful harvest is surely on the horizon. As is the case, Larry Medina is off to a good start as a farmer! After spending 15 years teaching and as head track coach at the now closed Bishop Ford H.S., Park Slope, Medina is in his second year working at Cathedral Prep and Seminary, Elmhurst. He joined the faculty last year as a physical education teacher but this year has taken on the roles of athletic director and head cross-country coach. In just a short time, he has implemented the system that led to much success at Bishop Ford both on the track and off. Medina has remained active in recent years as a runner. He began racing competitively in high school at Bishop Ford and then at St. Francis College, Brooklyn Heights. Through his experience in forming a program with the Falcons, he knows that patience is essential for a high school program. In just a short time, there has already been a stark difference in the runners’ mentality from day one until now, and it all starts with work ethic, which Medina said his seniors have done a fine job in setting the tone. This year’s roster is composed of 19 runners from all four years. Mondays and Wednesdays are the long-distance tempo runs, while Tuesdays and Thursdays are set aside for recovery runs in anticipation of track meets on Fridays and Saturdays. The runners seem to have bought into the program and are thus already seeing results. Joining Medina’s coaching staff is assistant Tim Harfmann, who ran cross-country at Cathedral from 2006 to 2010 before earning a spot as walk-on runner at St. Bonaventure University, Allegany, N.Y.
Medina wanted an alumnus who was familiar with the program in order to keep alive the rich tradition. Harfmann has already noticed quite the difference in the day-to-day operation of the program. “It was pretty much running from Cathedral Prep to Juniper Valley Park, finding as many hills as possible, but of course running on concrete there’s a significant difference,” Harfmann said. “So we did the best that we could. Preaching patience is one thing, but Medina’s runners have already seen actual results. Team members have shaved full minutes off their time on the 2.5-mile cross-country course at Van Cortlandt Park, the Bronx, and the team has eased into its goal of 40 total miles per week after starting out at 20 not too long ago. It was a process in the beginning to teach the young men how to look and act like runners, but once the student-athletes settled in, they’ve viewed the building of this program as a their own long-term project and they’ve really been “running” with it – no pun intended. “Our team is just starting right now, and as we move on to next year and the year after, we look to do bigger and better things and make progress,” said sophomore Daniel Berhan. Maybe the overall results won’t be as evident at the conclusion of this particular season, but judging by the mentality of Medina and his team, that’s all just a part of the process. Success will come if the runners continue to dedicate themselves to the program. But for now, the team has committed itself to more of the big picture. Expect to hear plenty coming out of Cathedral Prep over the next few years and beyond as the seeds of the cross-country program continue to be planted and sown. The long-term goals may be years away, but the Crusaders have begun traversing the path to earn a spot among the top teams in the Diocese of Brooklyn.